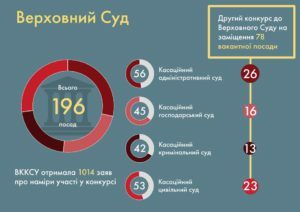 HJQC received 1001 applications for contests in the Supreme and Supreme Anticorruption Courts – ЧЕСНО. Фільтруй суд! The High Judicial Qualifications Commission of Ukraine summed up the results of the stage in which candidates submit documents for participation in contests to the Supreme Court and the Supreme Anti-Corruption Court. As of September 24, 2018, the Commission received 1001 applications with a package of documents, of which 659 – for participation in the second competition in the Supreme Court and 342 – in the High Anti-Corruption Court. On average, the competition for one position is 8 candidates and 9 candidates for one seat in the specified courts, respectively. It should be noted that during the first competition, 846 applications with documents were submitted to the Supreme Court for 120 vacancies, the competition was composed of 7 candidates for a place. Of the total number of documents for participation in the second competition to the Supreme Court, the Commission received 62% of applications from judges, 17% of applications from scientists, 14% of applications from lawyers and 7% of applications from candidates with cumulative length of service. 125 applications to the Economic Court of Cassation for 16 vacancies. 240 applications – for 27 positions in the Supreme Anti-Corruption Court. To recap, on August 2, 2018 the High Qualifications Commission of Judges of Ukraine announced a contest of 78 posts of judges of the Supreme Court and 39 posts of judges of the Supreme Anti-Corruption Court. Submission of documents for participation in competitions from judges, lawyers and scientists with relevant experience lasted from August 8 to September 14, 2018. Also, the High Qualifications Commission of Judges expects that the competition for the posts of judges of the High Anti-Corruption Court will end in the first half of February 2019.